10 bride-and-brother moments which prove that brothers are equally good bridesmaids! A saviour, a best-friend, an irritating nerd or a partner in crime; for a sister, brothers are nothing less than a beautiful blessing of God. I mean, sure they irritate you every now and then, but the memories of the moments spent with your bro squad definitely brings a tear to your eye when it’s time to say Goodbye! 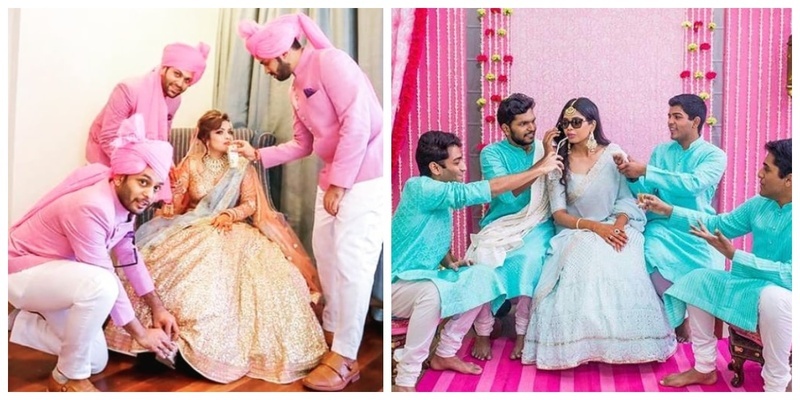 Check out a few candid shots of a bride with her #brosquad that we spotted, which would definitely give you sentimental hiccups! 1. The ‘I can’t do anything about her’ Brother! Having a brother by your side, who lets you have a smokey hookah blast right before your wedding sounds pretty amazing! 2. Brothers who can can easily make any emotional moment fun! Walking down the aisle with bridesmaids? I would definitely prefer my gang of bhaijaans over it, cause it sure looks fun! 3. The better than the bridesmaids Bros! Even facials becomes happening with your super cool brosquad! Just loved this one! This bride had no female friends, so guess who came to the rescue? Her amazing brother like friends! An outburst of cuteness in this one! 4. The ‘helping hand’ squad of bros! Always ready to help their sisters in times of need! Ever seen a bond so special and precious? 5. The ‘never would let you be hungry’ Bro squad! For you to stay fit and healthy during the hustle and bustle of wedding planning, there is nothing that your brother would not do. Even if it means spoon feeding their bride-to-be little sisters! 6. The adorable love of the #Badebhaiya for their little princesses! The eternal bond of love that binds a brother with his sister cannot be described in words. It’s just that when the moment finally comes to say goodbye, they hold their emotions with a gleaming smile. 8. The alcohol fun brigade of the brothers! They know how to calm you down when you’re nervous to walk down that aisle. Even if it involves a peg or two of your favourite alcohol! 9. The brother that cannot see his little sis shed a drop of tear! No matter how much they irritate you, they can’t see their sisters shed a drop of tear. I am getting emotional already! 10. The ‘protective of their lil sis’ brothers! If you are lucky enough to have a brother, you’d know that you would experience all the beautiful emotions with him; one of which is always feeling safe and protected! They’d definitely make sure their little sis gets all the love that she deserves! Take a moment to thank your Bhai for giving you a bucket load of moments of emotions to cherish! Cheers to the Bro squad!